The 1988 US Open was supposed to be Gigi Fernandez’s last Slam. She couldn’t handle her emotions and nearly quit tennis. But instead, she went on to become one of the fiercest competitors of the open era, winning 17 Grand Slams, is one of only five players in tennis history to win two Olympic Gold Medals, and is considered one of the greatest doubles players to ever grace the court (not to mention she was a top 20 singles player). So what changed? The Slam champ has long been making tips and tactics available online via her website and YouTube channel, DoublesTV. There, you can find expert advice on staggering, poaching, and the perfect volley. But now, she’s giving away the true secrets of a champion with her Mental Toughness Workshop, available for free. These days many a club owner or manager is saying, “I’ve seen the light.” The reason? GEI’s (Green Energy Innovations’) LED systems, which bring a new clarity and cost-efficiency to indoor and night tennis. GEI’s LED lights are also easy on the checkbook. “From a club’s perspective, they are getting instant on-and-off savings,” says Conlin. In NorCal alone, at least 22 clubs and sites have already seen the light about working with GEI. 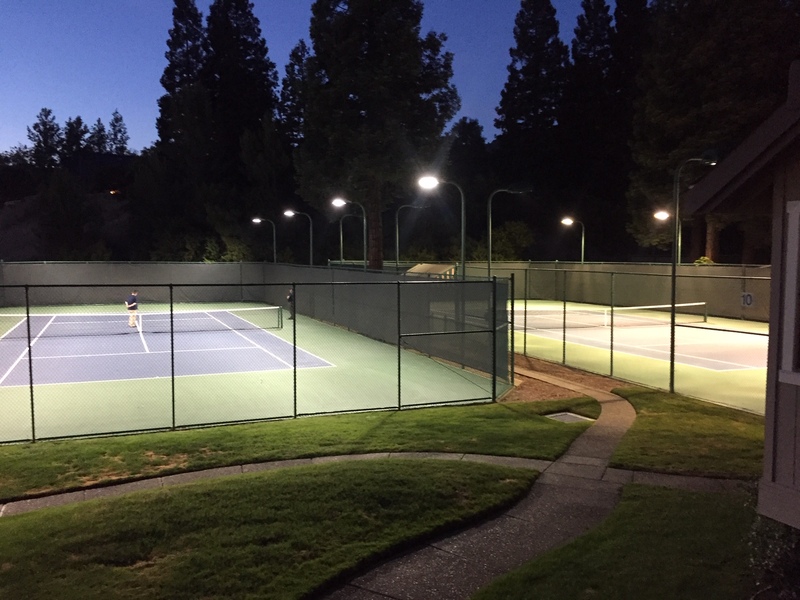 Conlin singles out some local stalwarts for special thanks in his success with installing GEI’s LED systems, including UC Berkeley’s Peter Wright, Dave Houston and DH Distribution, Chip Moreland and Vintage Contractors, Brian Hansen and Saviano Co. Inc. and Jim Thompson of Oakland Hills Tennis Club. Conlin shows up because of his passion for tennis. He’s also committed to the savings that come with switching to greener energy, giving clubs the option of PG&E’s On-Bill Financing program, and offering a 10-year warranty for up to 12-hours-a-day of use. Recently, GEI’s LED systems lit up an ATP pro event in Fairfield run by Phil Cello. “We received a lot of compliments,” says Conlin. As for the shift from old-school 1000-watt lights to 400-watt LEDs, he quips, “It’s like going from a ten-year-old Honda to a new Tesla.” For info call (415) 518-8862 or go to geiinnovations.com. Players seeking a great blend of power and control will find the perfect partner in the Babolat Pure Strike 16×19. The racket offers the maneuverability and easy acceleration players enjoy in the Pure Drive and Pure Aero, but the Pure Strike features a lower stiffness level and boxier beam for control. The result is a racket delivering impressive power without sacrificing control and feel. In the Pure Strike 16×19 we feel Babolat has created a great option for the all-court player who likes to add some variety to today’s power game. Best suited to intermediate through advanced level players. The iconic Babolat Pure Drive just keeps getting better and better. Huge spin and crushing power make this a popular choice with club players through to top pros. This updated Pure Drive features a retooled string bed. FSI Power Technology includes diamond-shaped grommet holes and wider string spacing for even more power and spin. The Cortex dampening system was updated to provide a more dampened feel at impact and mute the natural stiffness of the frame. Perfect for the modern aggressive baseliner who likes free power, our team also found great put-away potential at net for players who are forward-inclined. Stronger beginners through intermediate players will enjoy a solid blend of power, access to spin and ample control in the Volkl V-Feel 4. The racket’s versatile nature makes it a great choice for all-court players and doubles specialists. At 27.6 inches in length, the V-Feel 4 provides some added leverage for more pace and spin. The 105-square-inch headsize offers a generous sweet spot while the open 16×19 string pattern grabs the ball for added spin and control. Volkl has also improved its handle technology to include a new material called REVA for greater shock absorption. Volkl has completely revamped its 9 series racket with the Volkl V-Feel 9. This version is all about big power and big spin. A stiff beam construction teams up with an open string pattern to help players maximize big baseline hitting. At net the V-Feel 9 feels solid, with a direct and crisp response at impact. As from the baseline, stronger intermediate through advanced players will find lots of pace and spin available on serves. With its power and spin capabilities, the V-Feel 9 works just as well finishing off a point with a one-two punch as it does trading heavy shots from the baseline. Known for its hallmark blend of controllable power and feel, the Wilson Blade 98 16×19 Countervail adds a dose of comfort to create a modern classic. Wilson’s Countervail technology is designed to reduce shock and muscle fatigue without sacrificing the feel Blade fans love. At the baseline our testers found access to the big spin and easy depth of modern tennis, but there was still plenty of versatility to allow all-court players to be creative. Players who prefer lighter rackets might find this one tougher to maneuver and should check out the lighter Blade 98S. We recommend this one to stronger players seeking a well-balanced racket with a comfortable response. The Wilson Ultra 100 lives up to its name, delivering ultra power and spin. A great option for strong beginners all the way to the pro tour ranks, this is a racket that can be fine-tuned by your string setup. 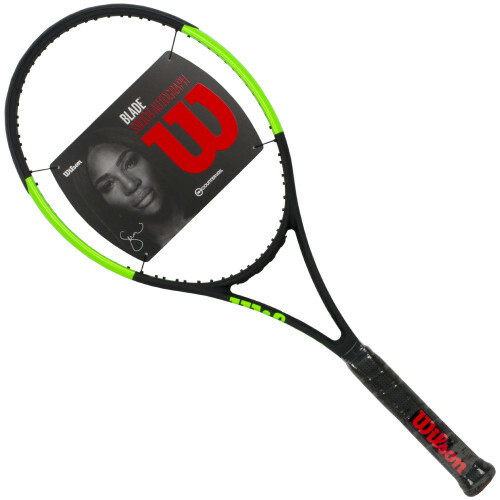 Players seeking power and comfort will love the response of the Ultra 100 with a multifilament string like Wilson’s NXT. Add a co-poly string and the racquet becomes a spin monster with ample control for big-hitting advanced-level players. From the baseline to the net, the Ultra 100 feels fast and user-friendly, making it a great all-court option. Players seeking a fast and easy-to-maneuver racket with solid baseline power will find a great partner in the Tecnifibre TFlash 300 PS. The PS in the racket’s name stands for Power Stab, a convex yoke designed to extend the length of the center main strings for more power, stability and comfort. Our play-testers agreed that the TFlash 300 PS delivered the goods. There was easy depth from the baseline, and the racquet was extremely user friendly. Some higher-level players would have liked a little more feel on volleys, but for other areas of the court the big power and easy access to spin was put to good use. Yonex hits another ace with the release of the Yonex EZONE 100 (300g). 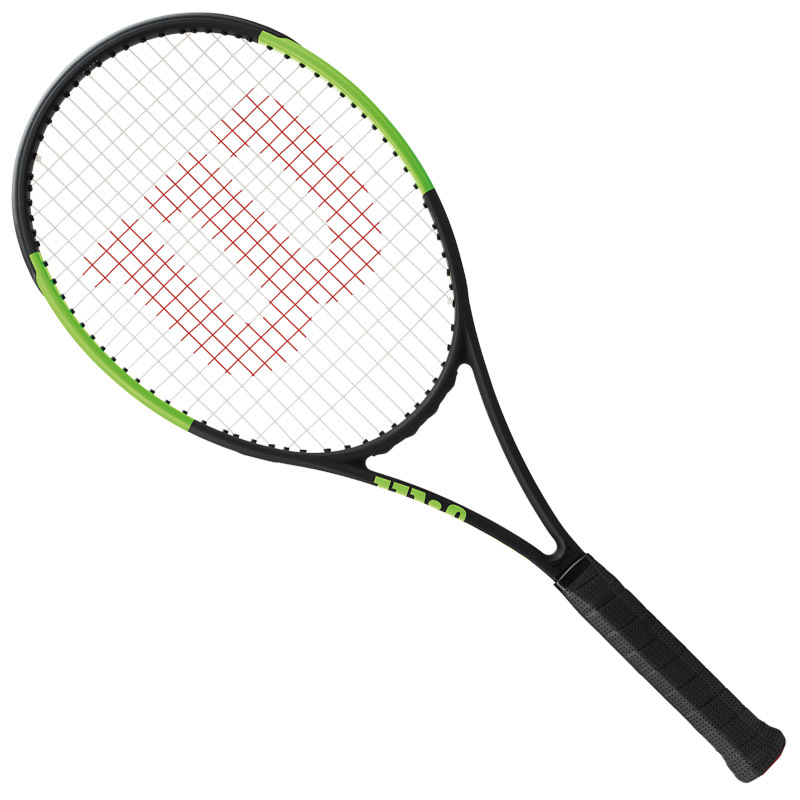 An update to the EZONE DR 100, this racket is loaded with new technologies and offers a firmer, crisper feel. The result is a stable-feeling racket that delivers controllable power. Our testers found the racket easy to get into position even when up against hard-charging opponents. At net the racket delivers ample power for deep volleying while blending a solid feel with easy maneuverability. Touch players may favor the previous DR version, but those seeking power and spin will find this update a better fit. The Yonex VCORE Pro 97 G builds on the popularity of the Duel G 97. While the two appear similar, a closer look reveals the Pro 97 G has dropped a cross-string (16×19 vs. 16×20) and offers a firmer flex. The subtle changes definitely sparked some magic on court. Better at withstanding big-hitting opponents, the Pro 97 G also provides more depth. Testers loved both the spin and the responsive feel from the racquet. Big hitters can step up to the heavier Pro 97 HG, which brings pro tour mass to every swing, but many intermediate through advanced players will find a great fit from this faster-swinging Pro 97 G.
Successful modern player’s rackets seamlessly combine spin, pace and control in an accessible package. The Dunlop Srixon Revo CV 3.0 does just that. From the baseline our testers immediately noticed the easy pace and spin they were getting. This racket features one technology to stiffen the frame, adding power and stability, while another, more flexible material softens the vibration for more comfort. All in all, the Srixon Revo CV 3.0 impressed our testers and is a great option for intermediate through advanced-level players who prefer user-friendly rackets. Following a rich heritage of successful and beloved rackets, the Head Graphene Touch Radical MP is the newest stop on the Radical line. Don’t be fooled by the name, though, this newest Radical is loaded with spin and power thanks to a stiffer layup of graphite. That stiffness is complemented by Graphene Touch technology, which noticeably dampens the feel at impact for a plush and comfortable experience. Due to its power and spin potential, this racquet should suit a variety of playing styles and levels, but intermediate and advanced level players who like to take aggressive swings need to give this one a serious look. The Head Graphene Touch Prestige Tour is an all-new offering in the Head Graphene Touch Prestige line. Weighing in on the lighter side of the Prestige family, the Tour is a user-friendly option and perhaps the easiest entry into swinging a Prestige. Many testers found control and maneuverability to be the racket’s main attributes. In true Prestige fashion, power generation is mostly left to the player. In the right hands (likely stronger intermediate through advanced-level players) the Graphene Touch Prestige Tour lets players swing aggressively and rely on the racket’s excellent control and stability to keep shots on target. Few players have had the honor of an autographed Wilson racket in their name. It’s a distinction with impact – Wilson’s Chris Evert racket was one of the most popular rackets of the ‘70s. Serena Williams is one of the handful of legends – Evert, Jack Kramer, Billie Jean King and Roger Federer – to receive the honor, now with the Blade SW104. The signature stick, one of several with Wilson’s new Countervail technology, has received high praise – IT racket reviewer Marcus Cootsona singles out the Blade SW104’s power on the baseline, at the net, and of course, from the serve. Find out more at wilson.com. Not one but four new high-performance Wilson rackets in the company’s Blade performance series feature Countervail technology. A patented, one-of-a-kind carbon fiber that originates from the aerospace industry, Countervail reduces vibrational energy. Serena, Milos Raonic and Madison Keys are just three pros who play with Blades. For a smoother stroke, try the Blade 98 (18×20), Blade 98 (16×19), Blade 98S and Blade SW104. For more info go to wilson.com. Classical musicians may talk about string quartets, but now California’s Solinco is talking about their new tennis duet. Translation: the company has entered into an endorsement deal for tennis strings with 16-time Grand Slam champions and Olympic gold medalists, Bob and Mike Bryan. “We were looking for an edge and extra pop on our strokes and the Hyper-G gives us all that with great feel and durability,” said Bob Bryan. The signing of the Bryan Brothers highlights Solinco’s quickly growing presence on the ATP and WTA Tours and commitment to continue developing and producing the highest quality performance products for the world’s best players. The Bryans will have Solinco’s “O” logo on their strings to represent the brand. 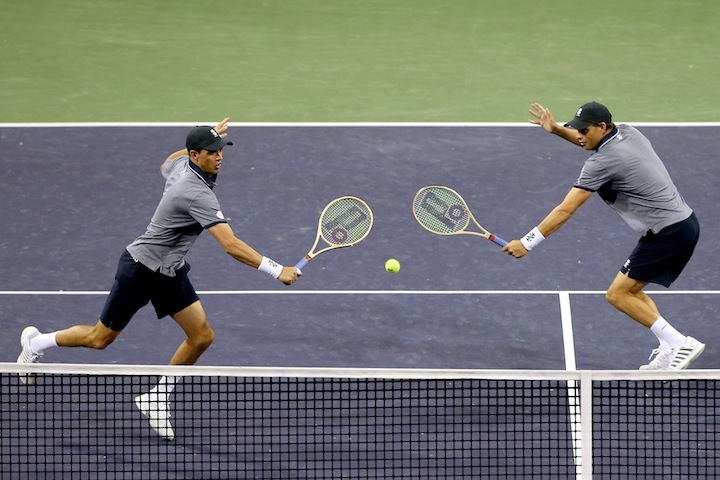 The Bryan Brothers are the most successful doubles team of all time with a record of 112 titles, 16 Grand Slam championships, and winners of Olympic gold at the London Games in 2012. They join Team Solinco alongside Jamie Murray (2016 Australian Open & US Open doubles champion), Malek Jaziri (ATP pro), Jamie Loeb (NCAA singles champion and WTA pro), Noah Rubin (junior Wimbledon Champion and ATP pro) and Alla Kudrysetva (WTA pro). College placement is the top priority at Weil Academy, and 29 seniors from Weil’s Class of 2017 have now signed national letters of intent or committed to NCAA colleges to continue studying and playing college tennis. Weil Academy players took part in the recent BNP Paribas Open, playing in the pre-qualifying event, and serving as hitting partners for some of the world’s top players, including Novak Djokovic, Dominic Thiem, Grigor Dimitrov and the Bryan Brothers. The Weil Academy has built six new courts and will host the Pac-12 Women’s Team Championships at the 117th Annual Ojai Tennis Tournament from April 26–30. On May 25, the 20-year Weil Academy Anniversary Celebration will take place. Email enrollment@weiltennis.com for more details, or if you are an alum and would like to attend. Weekly camps at the Weil Academy start in full-force May 28 and continue all summer. Check the Weil website at www.WeilTennis.com for rates and to register. The future is here today, and now – finally – players and clubs can use something more attractive and fool-proof than flip cards and plastic tubes, thanks to TopScore, the world’s first and only digital, two-sided, net-mounted, self-scoring tennis scoreboard. A foot tall and nearly a foot-and-a-half wide, weighing in at just over five pounds, TopScore comes in two different handsome combinations of dark green and white. “The response has been 100-percent positive – some of the finest clubs in the world will be using TopScore,” says Kincaid, adding that many tennis facilities have already expressed interest in putting TopScore on their net posts. 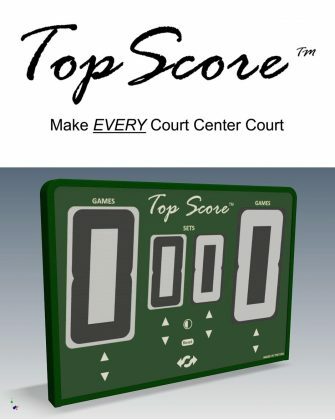 Built to withstand being struck by tennis balls, and designed to “Make Every Court Center Court,” TopScore‘s features include up/down arrows for both sets and games, a reset button, a home/visitor function and a changeover button. The latter is especially popular among players, as the numbers flip sides with no spinning of the board. Each TopScore comes with a net post and bracket as well as a cover. In ordering TopScore, any tennis club makes an instant premium upgrade to its facilities. TopScore‘s attractive exterior includes an area to display logos, advertising or board sponsors. As Kincaid puts it, “Our ability to add logos and customize the board for tennis clubs makes it that much more special. You can advertise on the scoreboard, which turns TopScore into a revenue-generating asset.” Topspin Sports will customize TopScore for no additional cost. To order TopScore or find out more about it, go to topspinsportsllc.com.